Our concluding chapter draws on the concepts and theories discussed in the book, particularly the concept of governance, collaboration, and the role of trust. The chapter focuses on the practicalities of information disclosure. It asks: how must this process be governed? A definition of governance as the process of steering a society toward a set of predefined goals is introduced. It discusses the benefits and difficulties of creating collaborative governance in the context of our project. The chapter presents our findings regarding governance from the I-Choose project. 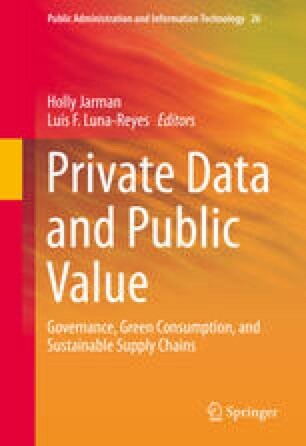 It evaluates existing experiments in collaborative governance that aim to extract public value from data disclosure, drawing on several examples from multiple countries, including the I-Choose project. We find that information disclosure alone is not enough to enhance the public sphere. It must be supported by innovative governance mechanisms that address classic problems such as establishing independence among producing and regulating organizations and creating procedural transparency. Büthe, T. (2010). Private regulation in the global economy: A (p)review. Business and Politics, 12(3). http://doi.org/10.2202/1469-3569.1328.